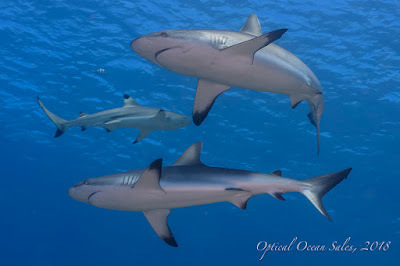 Final part of my dive journal from a recent trip to Truk Lagoon, see Part 1 and Part 2. San Francisco Maru. This is the deep, big-time "money" wreck here in Truk. The Odyssey is much more organized in diving it now, as before Capt. Lenny only took a few of us out to do it in the skiff. Now they have just put in a mooring and with enough DM's in the water, they are able to lead groups of 6-8 down to it's decks at 165'. 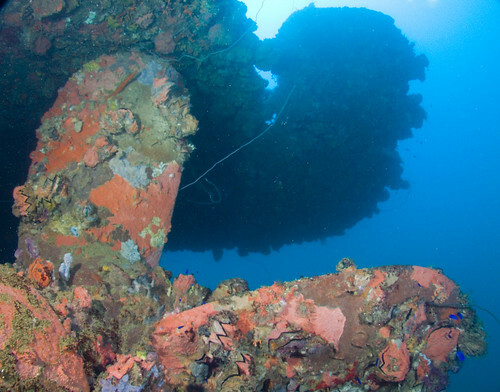 Called the "million-dollar wreck" for it's wealth of cargo and relatively un-touched state, it's a very interesting dive with lots of see. After a through briefing, we split into two groups and gear up. We are diving 23% EAN, really actually air, with a 15 min (or 1500 # of gas) bottom time starting on our descent that takes around 2-3 mins. Time is very short and I have a pre-visualized dive plan to take pictures of the tank, deck gun and hold one where land mines, artillery shells and cordite are stacked to the ceiling. Things go pretty much according to plan, I'm not too narced, concentrating on my dive plan helps. I get some good shots and enjoy shooting up out of the ammunition holds with no one around. I'm sort of amused at myself directing Paul a little higher and lower over the deck gun, art direction at 170'...once an A.D., always an A.D. I have one minute left of bottom time and motion Paul that I'm going back for a couple of quick shots of the tank, after which I get turned around, but sort myself out and head quickly for the mast and start up. In the one minute or so, I burned 300# of gas! We ascend slowly, taking lots of time up the mast and switching to the line at 100' then back to the boat. I clear my 30' stop on the way up and move up to 20' to do 3-4 mins there, only to find that the line is loose and I bob up towards 13'. Charlie comes over and motions us to the mooring ball and line that is fixed better and I clear, wait a bit for Paul and then take off for the hang bar at the back of the Odyssey, finding a bit of a swim in the current and with the boat swinging away from me. I make it there and have another 4-5 mins or so of final deco at 10', but Paul comes up and his Suunto has him slammed with 12 mins. During the week, we're finding that his computer is much more conservative than my Oceanic, and I consider it to be a fairly conservative computer. 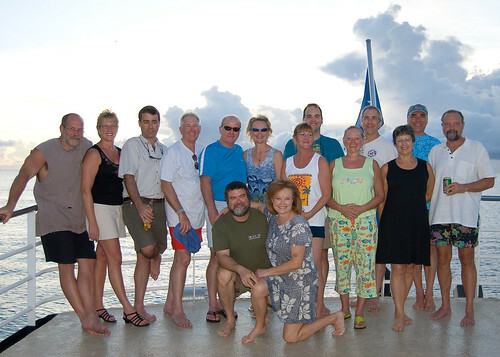 The second group also enjoys their dive and all are back on deck after doing a fairly difficult planned deco dive. Rio de Janero Maru. This is one of my favorite wrecks here in Truk. It lies on it's starboard side with the bottom at around 140' and the top, or port side, at an easy 45'. It is massive at 360' in length, a converted freighter/cruise liner that was fairly well-known before the war and infamous during the war as a coastal raider and transport. The US was quite happy to put ships like her and the Heian Maru on the bottom. I guess I like it because of it's history and that it really looks like a wreck as depicted in the movies. 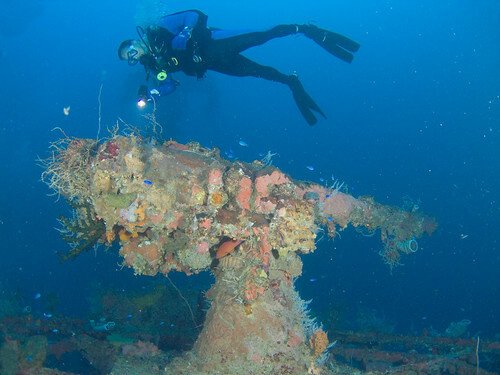 Only in Truk can you dive wrecks like the SF Maru and the Rio in one day and it's a real treat. We drop in and swim down, enjoying decent viz to start that seems to diminish as the dive progresses. The scale of the wreck is awesome, huge stack on it's side, holds and bomb damage twisting plates and making for interesting views. Our plan is to make for the props and take a few shots of Paul, myself, as well as out friends Carol and Greg. The props are massive and make for a good frame. After the others leave, I drop down over the huge rudder and enjoy shooting the lower prop and rudder. I even sit on one blade and take in the vista, dwarfed by the looming wreck. We swim back around and poke around the various spaces, spying s small eagle ray circling about. 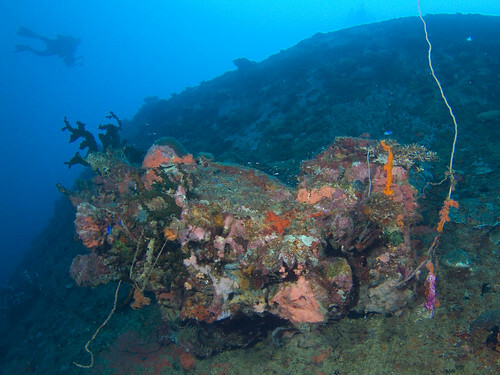 There's not a lot of growth on this wreck, mostly small mounds of hard coral on the side of the hull. I shoot a porthole on the side that still has it's glass in it. The Odyssey is swinging on it's mooring in a wide arc and after swimming up to the hang bar we enjoy and E-ticket ride swinging back and forth above the massive wreck doing our deco stop. After hearing good things about the engine room, Paul and I ask guide Kent to take us there. 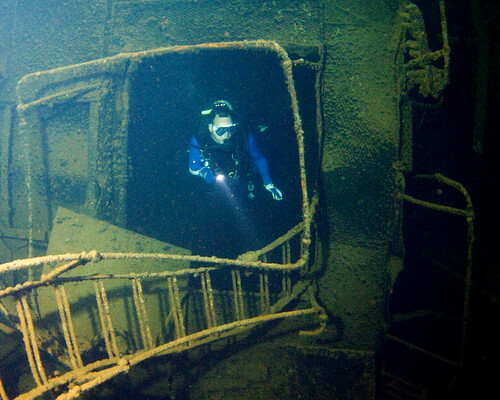 We quickly swim down to a doorway and into the pitch dark wreck at 80', ducking over and under gangways and pipes. We make it into the engineers' space with walls covered with gauges and valves, engine telegraphs gleaming in the dark. A small clock lies hangs upside down stopped at 7:20 am, presumably when the ship sunk. Kent leads Paul further into the tight spaces while I take some pictures. The strobes are firing intermittently now and it's driving me crazy. Seems like a bad sync cord. We exit the engine room and go to the aft hold that is about half full with beer and sake bottles and boxes. Again I see deterioration in the wrecks and although there's still thousands of bottles and cases, much of it has fallen down to the bottom. This is mostly the result of natural deterioration of the wood cases. We come up on top and it's now too dark to shoot much, so I decide to swim up to the caved in bow. Four years ago I got turned around in the blown apart forward magazine and I had a personal ghost to exhume to see it again. I thought it was just along the edge, but I forgot that the whole bow had partially collapsed because of the explosion. It seemed that it too has fallen down further from deterioration as well, but I can't quantify it in my mind. I swam on down to 95' and looked for what was left of the magazine. All I could find was a twisted opening and it didn't look like where I had been on the earlier trip. But I stuck my head in and it started to look a bit familiar, however I couldn't find the unexploded 6" shells that I found before. I looked it over, wondering what the hell I was thinking when I went in there at night with limited air the other time. I guess I found my peace and thanked some higher being for my good luck in finding my way out. Coming up over the edge of the hull, I found the name on the bow and brought Paul down to see it as well. I was into a few minutes of deco, so we went up, found the Odyssey on it's swing over the wreck, went up to the hang bar and paid our dues to the deco god. Nippo Maru. Another nice wreck, a water carrier, a bit deeper than some, but with a particularly good wheelhouse and deck cargo of cannons, tanks and munitions. We jammed down to the wheelhouse and got in there before the viz got spoiled. I took a few shots, now really fighting the strobes and ten continued down to the aft deck at 135' to shoot the deck cannons and have a look around. As we came back, Paul found a nice pair of mating nudibranchs and I switched over to macro to shoot them. Lying at 125' trying to get them in focus and having the strobes first over-expose, then not fire was frustrating. I finished the shot and swam up with about 1100# of gas left and into 6 mins of deco and made for the bow and up line. I couldn't find Paul, he went into the cabins apparently and racked up a long deco stop, so that I was on the boat before I saw him again. I shot a few quick shots and a couple of natural lighted bow shots on the way up. Back on board I determined that the optical sync cord had broken at the strobe connector and I was able to strip off a new end to fix my lighting problems. Dive 19. Feeling that I hadn't done the best job in the wheelhouse, with its wheel and telegraph still standing there, I went back and got better shots. We also went down into the forward hold and I shot some large piles of artillery shells there, as well as some nice bow shots and finally captured the anchor lines I was looking for with the ship anchored for eternity. we finished up on the mast I shot a small moray eel without much success. Kensho Maru. This was the only wreck I hadn't dove on before. Located back in the repair anchorage where we started our cruise. It was a smallish freighter without a great deal of interesting cargo, but with a very open wheelhouse, cabin and engine room. When we got in we were greeted by very cloudy viz and huge numbers of jellyfish that made it difficult to find see much of anything at first. Following a line down to the ship, we swam around the cabin and I amused myself shooting some artifacts, not really seeing much else. I had wanted to find the radio room and while looking I saw both guides swim quickly through a skylight down into the center of the wreck. Swimming though I found a massive, wide-open engine room with huge pistons, boiler and valves that I played around shooting. Coming up Paul pointed me to the radio room, now just a rack of old gear. Poking my head up through the cabin roof I found a very nice telegraph that I also shot. We came up the forward mast and found some nice anemones with their resident clownfish to finish the dive shooting. Making our way back forward and to the Odyssey in the murk and jellyfish, I felt that it had been a very good week rediscovering some great South Pacific diving in Truk lagoon. We spent a night packing and eating leftover food and drink on the boat. Sunday, we were delivered to the Blue Lagoon Resort for dayrooms until our flights. After everyone rested a bit we met for lunch at around noon. The restaurant is an exercise in patience, futility and exhaustion. It took nearly 2.5 hrs to get a burger and meals ordered and eaten. The food is ok, or mediocre if you guessed wrong. After that, we decided we needed a drink. 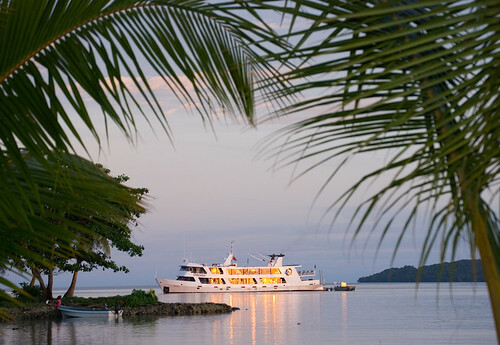 Several folks had bought booze for the boat, only to find that it was included. So there was a spontaneous cocktail party starting in our room and quickly spreading to the lawn. Lawn chairs, coconut palms and a stunning sunset to enjoy. 151 rum is dangerous stuff and by the time our dinner reservations were ready, a few members of the group had to be carried to the table. They had plenty of time to sober up, as dinner again took 2 hours+, with repeated trips to the kitchen to beg water, silverware or "service". The waitresses are locals and really, they just don't get it. Not their fault, cultural I think, but the hotel needs to spend much more time training them to work in a touristic environment. Although the hotel is nice, and their in-house dive op good, trying to get fed in the place is enough to drive you nuts. After getting onto the Guam/Hawaii flight we had an ugly incident with a man having a heart attack in mid-Pacific, three to four hours from anywhere. Luckily there were two docs and three nurses on board who worked very hard under difficult circumstances to give CPR and resuscitate him. Unfortunately he didn't make it and died. After guiding his poor wife to first class, they wrapped the body up and left it in about row 40 for the duration. Pretty surreal. We were met by the coroner and sheriffs in Honolulu, and after a brief investigation were were allowed to continue our way home. Photo notes: Truk requires lots of strobe power and wide angle lenses. I was shooting two Inon strobes and I really missed my old S&S 120 at times. Buy the biggest dome lens you can find and long strobe arms. It's a pain to take into the wreck, and I would figure out some sort of dome cover that you can take on and off uw, but it's the right gear for the job. There's some macro life, but it's not prolific. Visibility is up and down there, I think the Spring may be better than Fall. It varies, as you get out to the outer anchorages it can improve, but the amount of junk in the water can be frustrating to deal with.